Crime Watch: A Stav in the Dark: Sherez scoops Theakston prize! A Stav in the Dark: Sherez scoops Theakston prize! It was with great anticipation that I settled into my seat in the grand ballroom at the Old Swan Hotel last Thursday evening, wondering who would emerge from a stellar shortlist to be named winner of the Theakston Old Peculier Crime Novel of the Year prize. The general chatter among attendees was that it was one of the strongest crime shortlists they'd seen in many years, across many prizes. I would agree. Three of the six novels were among my 'best of the year' picks for 2017, across crime and thriller novels from all countries (INSIDIOUS INTENT by Val McDermid, THE LONG DROP by Denise Mina, and THE INTRUSIONS by Stav Sherez). I'd heard fabulous things about the other three finalists too - Mick Herron's SPOOK STREET, Abir Mukherjee's A RISING MAN, and Susie Steiner's PERSONS UNKNOWN. So who would emerge as the queen or king of British and Irish crime? THE INTRUSIONS by Stav Sherez. There was loud acclaim from the hundreds in attendance, and genuine joy from other crime writers that Sherez, a terrific author of huge talents and storytelling skill, had emerged from such a strong group of finalists. I was siting at the back of the large ballroom, beside Sherez's fellow Faber authors Laura Lippman and Alafair Burke, and there were spontaneous whoops of delight from all around me. It was all very exciting - but it wasn't just Sherez's stablemates that were happy. Over the course of the weekend I had discussions with so many authors who were absolutely stoked. "I’m so shocked," said Sherez on the night. "Thank you so much for everyone who reads books, everyone who buys books, and talks about them. The world is full of hardships, but we have so much great stuff in culture and it means so much that there’s something to hide in." On the night, Sherez talked about the inspiration of social media offering a new vein of storytelling and criminality. Other authors chatted afterwards about how THE INTRUSIONS might in future years be seen as a mile marker for crime writers weaving technology and social media into their stories. THE INTRUSIONS had already been a 2017 Guardian and Sunday Times book of the year, dubbed ‘A Silence of the Lambs for the internet age’ by Ian Rankin. The book was acclaimed by critics for its echoes of Emile Zola and influences from Graham Greene to Dostoevsky. When reviewing THE INTRUSIONS last April, I said that Sherez wrote: "literary crime thrillers with a joyfully dark heart" and "beautifully entwines style and substance in his crime novels, delivering some heft without disrupting a smooth, page-turning narrative", and also predicted he might get some love from crime awards judges. I'm very glad that has come to pass. He's a brilliant writer. Sherez was presented with his award by title sponsor Simon Theakston on the opening night of the world's biggest celebration of the crime writing genre. Sherez collected a £3,000 cash prize, as well as a handmade, engraved oak beer cask made by Theakston Old Peculier. This year's award was run in partnership with T&R Theakston Ltd, WHSmith, and The Mail on Sunday. The winner was decided by the panel of judges, comprising literary and media figures chaired this year by Lee Child, alongside a public vote. "The Intrusions are the stuff we have all around us – all the static and scatter of TV and phones – everything is impinging on our consciousness and you don’t have time to think," said Sherez. "So many great crime writers have come before us that have used all the great plots – Christie, James Ellroy – it’s good to have new criminality to deal with. But it’s not only criminality, the internet is affecting politics, it’s affecting elections, it affects us and our kids." As well as dealing with the omniscience of modern technology, THE INTRUSIONS is structured around the lead character – Carrigan’s - visits to the hospital to visit his mother who suffered a stroke. 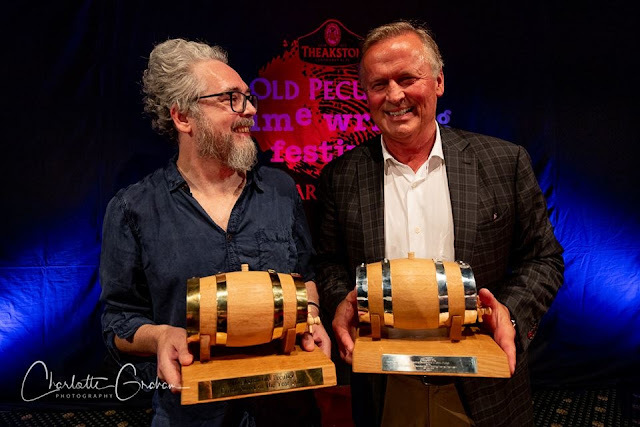 Before Sherez was named this year's winner, a special presentation was made to John Grisham as the winner of the ninth Theakston Old Peculier Outstanding Contribution to Crime Fiction Award.